→How To Achieve Creative Success In The Iron-fisted Corporate World? The world was never ready for creativity. The creative geniuses always faced resistance. But today, with so much hype about innovation, have things changed? Is corporate world waking up to breakthrough ideas? Sometimes it appears so. Innovation might be the most used core value by organisations. And yet, try to propose an idea which goes against the grain in these same organisations. We will see resistance. Isn't it? Successful creative people understand these realities. They know it takes more than just the ideation skills to survive in the corporate world. Let us see what smart, creative people do to succeed in the corporate world? All companies are feeling the pressure to be innovative. It’s easy to write a core value and put banners, but it’s not easy to transform the culture in a day. HR and higher managers need creative people to trigger the process. That’s why it’s important to position yourself as someone creative. • Be different, but not much. Wear a T-shirt rather than a striped shirt. Or make your tie a little colourful. Also, loosen it. • Manage Your Desk: Put a creative-quote on your soft board. Add some innovation books to your work desk. Use a different kind of pen stand. Put a picture of yourself playing in the mud with kids, or you dancing in the rain. Give hints that you are ready to play it differently if the opportunity strikes. Most people in the corporate world are conditioned to think in old ways. Many of them even cynical. Use the law of contrast to your advantage. Be part of the solution gang. Believe that things can get better. That's what the corporate world needs the most. • Participate in creativity and innovation interventions: Be the first to apply for the innovation interventions happening in your company. If there are no programmes, request for one to your learning and development team. • Circulate creative case studies among your colleagues; it could be about an exciting and inspiring 'out of the box' solution that helped another organisation. ‘CC’ everybody in the mail. Also, ‘CC’ your boss's boss, that's important. Include HR people too in these messages. Don’t write--Why can’t we do something like this in our organisation? It will offend many people. Simply share the stuff. And keep sharing more information. • Refer to your CEO and his speeches: When your CEO, CFO or other CXO says something about innovation, post about it on the professional platforms like LinkedIn. Rest assured, you will find opportunities. In these times no one can be a CEO without referring to innovation and creativity. • Talk to HR. Express your willingness to work on innovative projects. No company is so dry that there are no innovation projects at all. You will get your chance. The critical thing to remember is this- help your boss look good in other people’s eyes. It will help you get her trust, and you will get more opportunity to showcase your skills. • Make captivating presentations: Presentations are an excellent place to make your mark as a creative person. Forget the old powerpoint templates. Use storytelling to your advantage. Or create a visual flow-chart. If you can make an engaging presentation about how your department achieved something remarkable, you will win the confidence of other people in the team. You will also stand out. In today’s corporate world, projects are often shared by more than one department and function. Thus, these presentations will showcase your creative skills to other people in the organisation. It’s also a great way to bypass your boss. Interestingly, your boss will share these with her bosses and they will find you out. Soon you will be known as the guy who created those interesting info-graphic. Give your boss more of these tools, and it will launch you on the creative path. The senior people will borrow you from your boss to help them in their projects, there again you can contribute your ideas and can make your presence felt. • Lead the team: When people are stuck for ideas, announce--“I have read a new idea generation technique in a book, should we use it?” Facilitate the session. People will be excited, and soon start calling you ‘The out of the box’ guy. • Use your authority: Everyone has his circle of influence, decision-making power, allocated resources at hand. Use these to bring creative thinking to your team. A precaution here. Don’t emulate the artists; no creative airs for you, you are working in a corporate environment. Don’t get too inspired by Steve Jobs and other Silicon Valley mavericks. They were the bosses. You are not. Don’t get into a head to head conflict with people. Remember, they are not trying to stall your ideas; they are conditioned to think in a particular way. So, in spite of all our honest efforts and intentions, opposition to ideas will remain. Don't take it personally. It is part of the game. Keep patience. Listen to your colleague’s objections, find out common ground and move ahead from there. See strengths in people and use it for your objectives. Once you have some success, your voice will be heard. Create a network of like-minded employees in the organisation. Find out other idea-champions in the organisation. Go and ask them for help. Exchange ideas. It will help you understand the pain points for the organisation. Your access to other people and their resources will enable you to join the dots better. And then your idea won't be just ideas, but solutions which the organisation is looking for. Your ideas will be accepted quickly. If there are any idea contests or innovation challenge in your company, be the front-runner. Put your heart and soul in it. Winning it will help you get spotted faster than ever. It will also help you later in your career with other organisations. Show enthusiasm. Put a maximum number of ideas in the idea box. Offer your time to teams who are coordinating these efforts. Gain credibility by small successes. Once you have the trust of your seniors, you will get creative success faster. Align your ideas with organisational objectives. Don’t go by speeches; watch out where the organisation is putting the most amount of time and money in real life. Focus your energies there. Your ideas will score better with authorities, and you will find talent and resource allocation for your initiatives as well. In the beginning, propose projects which are low cost. Focus your energies on cost-cutting and waste-elimination. If you can save money, time and energy for the organisation, your ideas will get a warm welcome. Establish yourself as a creative talent, one with a successful track record, then your voice will be heard, and you can go for ambitious projects. Creative geniuses are masters of human psychology. From Leonardo Da Vinci to the start-up guys getting maddening amounts of money for their concepts have something more than just ideas. They know how to win the confidence of the people. Use the same for your success in the corporate world. Do share your success stories with me. Remember To Receive Your Free Gifts! 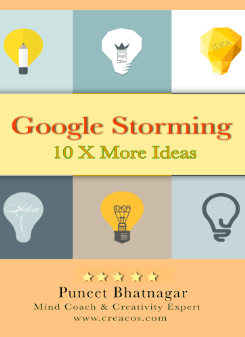 Google As An Idea Generation Platform! Yes I Want The Free Gifts!